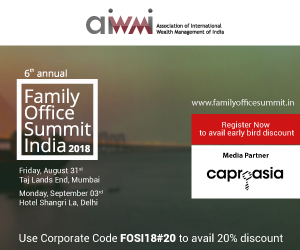 AIWMI is delighted to announce the 6th edition of the prestigious Family Office Summit India 2018, scheduled in Mumbai on September 3rd. Family Offices once the preserve of a select few are becoming increasingly ubiquitous. We see an increase in the number of wealthy individuals globally with age-old concerns around wealth preservation, corporate governance and succession planning remaining. Globally, wealth is increasing, and the need to retain and build on that wealth remains paramount. For numerous reasons, the big wealth managers and private banks have lost ground and credibility: the Family Office is on the rise. The USA is no longer the prime reserve of the Family Office. There has been a substantial increase in the number of European based FOs, although numbers still seem to be more an estimate than hard fact. The timing of when you decide to establish a Family Office may depend on a range of factors, some purely financial, some social and some exclusively family orientated. From the very beginning of the concept, it is advantageous to seek informed, professional advice to minimise the likelihood of mistakes. With over 400 Ultra and High Net-Worth Individuals and Family Office Executives every year, the Family Office Summit India is the countryís largest wealth management & family office event held annually in Mumbai. This prestigious conference provides an annual meeting place for the Indian High Net-Worth Families, Single Family Offices , Private Investors and Thought Leaders. The conferenceís continuing success since its inception testifies to the coming-of- age of Indian family office community and the need for an effective cross-learning and networking forum. This prestigious Summit, year after year has presented a prolific forum to uncover how wealthy families are handling many of their most pressing issues and challenges including their key objectives, investment styles and management of philanthropic activities, as well as encouraging the next generation, compensating executives, retaining trusted employees and more. Caproasia Online subscribers are entitled to get 20% off the ticket purchases. Quote promo code FOSI18#20 upon registration. Limited Partners* benefit from a free entrance to the Conference. *Are qualified for complimentary invitations Pension Funds, Family Offices, Foundations, Endowments, Sovereign Wealth Funds, Insurance Companies, DFIs and Business Angels that do not engage in third-party fundraising activities or collect fees for advisory/consulting services.